Community Booth participant is once again Transition Town Hartland - if you have not tried their solar smoothies, you're running out of time! At the market and need some dinner? Look no further than the Raycin Farms booth. Raycin Farms is owned by Raymond and Cindy West of White River Junction. 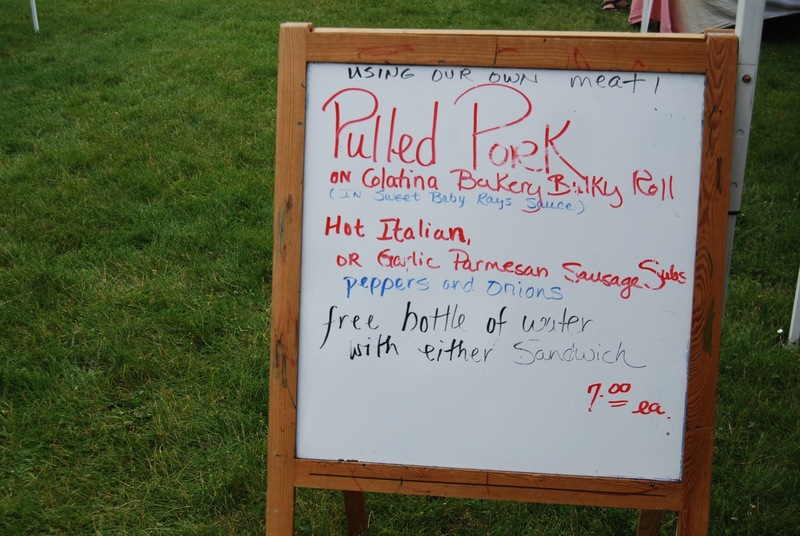 Each week, Cindy dishes up some of the best pulled pork sandwiches and sausage subs in town all made with local, Raycin Farms meat. 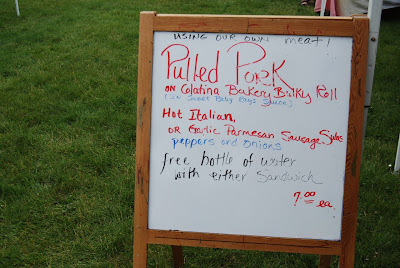 You can take home frozen meat as well as Cindy brings a cooler full of pastured pork and grass-fed beef to each market, but stop by early. Cindy sold out of her ground beef last week! For dessert try one of her famous buttermilk doughnuts, whoopie pies, or specialty cookies (I love the chocolate chip, oatmeal, coconut, and corn flake cookies!). The pumpkin apple bread is not to be missed--regular customers return again and again for a slice. 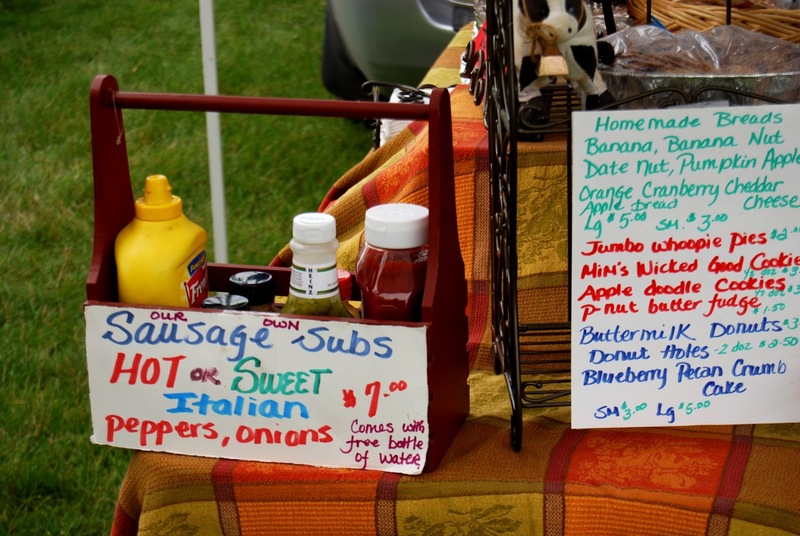 Visit the Raycin Farms booth for local sandwiches, baked goods, freezer meat or to inquire about purchasing a larger cut for your freezer or next party. 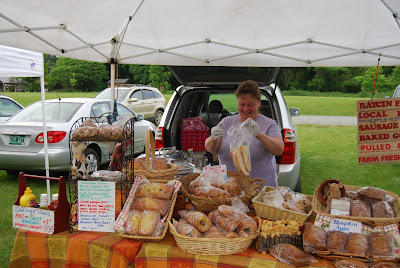 Cindy will be at the Hartland Farmers' Market each week. 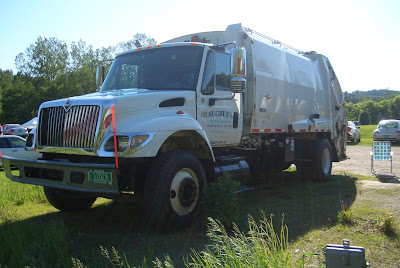 Rubbish Removal is offering a great deal! Ultimate Frisbee from 5 - 7 pm -- Everyone Welcome! Clay Hill Corners is a blueberry and vegetable farm owned by Carol Stedman and Marty Banak in Hartland, VT. This seven-acre farm has a high tunnel, a greenhouse, a small hoop house and many outdoor garden beds. A flock of Indian Runner ducks helps keep the insects at bay as Clay Hill Corners uses organic practices only. Carol is famous for her spicy greens, a special mix of salad greens that includes mild lettuce and spicier greens such as arugula and mustard. In addition, Carol bakes homemade quiches using ingredients from her farm and other local ingredients from her friends and neighbors. Look for these specialties and other treats such as seasonal jams, pickles, honey, hummus, and granola at the Clay Hill Corners booth each Friday or visit the farm stand at 390 Clay Hill Road in Hartland. 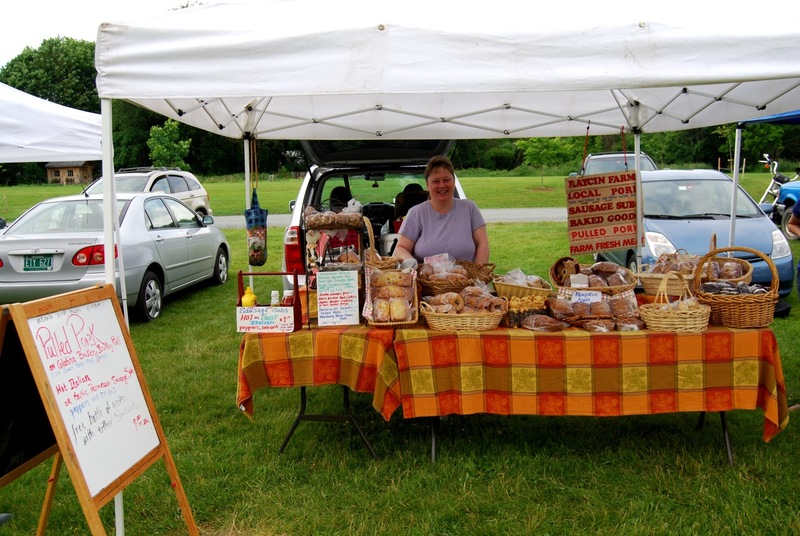 To learn more about Clay Hill Corners and their CSA, stop by their booth at the market or visit their website. Hartland's own Bugbee's Rubbish Removal has been in the business for fifty-nine years and now will be at the Hartland Farmers' Market each Friday. 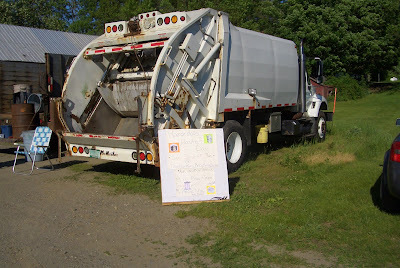 If you have trash or recycling, just bring it with you and stop by the red town barn. For a mere $3 per trash bag or $1 per box of recycling, you can lighten your load and support a local business at the same time. 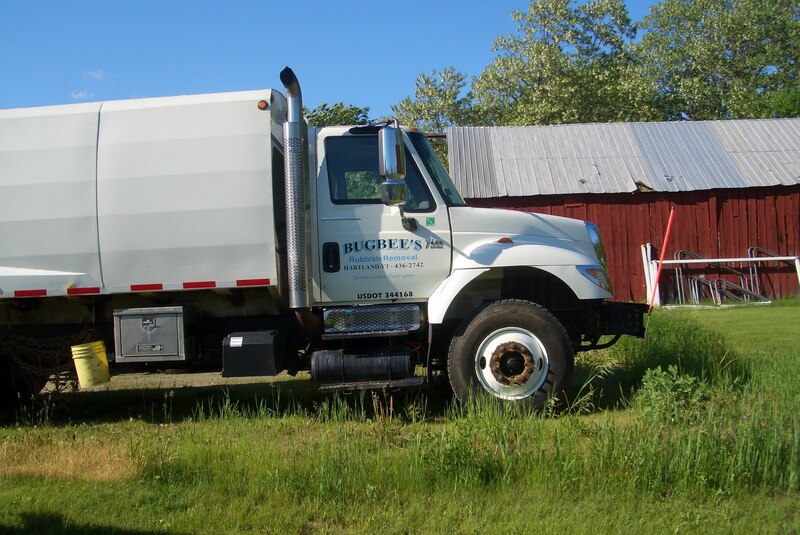 In addition, Bugbee's Rubbish Removal will tackle larger items as well. Just give them a call with your questions-- 802-436-2742--or stop by the market to meet them. Bring your kids! They'll love a close-up look at the truck. We are happy to partner with Bugbee's Rubbish Removal to provide this convenient service during the Farmers' Market hours. Please consider bringing your trash and/or recycling this Friday. Live music by Shades of Blue. Two Community Booth participants: Hartland Garden Club and Transition Town Hartland. 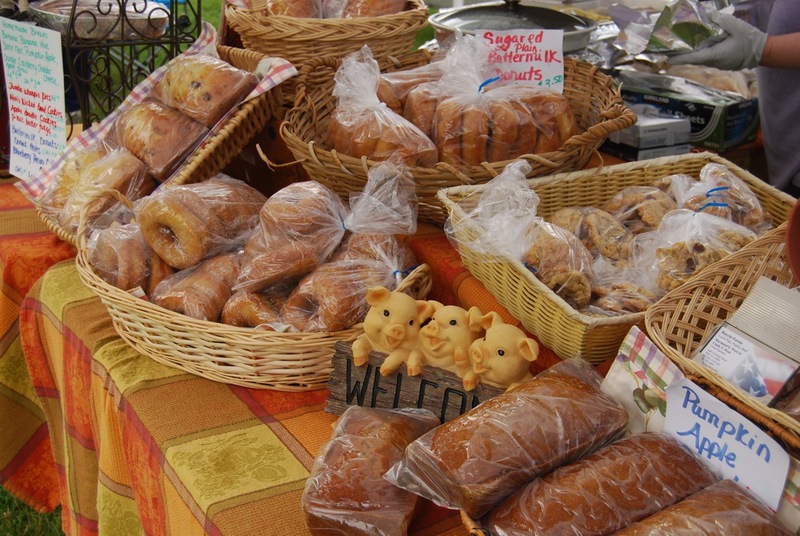 The Hartland Farmers' Market kicks off this week! Each Friday from 5-7 PM there will be a pick-up Ultimate Frisbee game at the nearby library fields. All welcome! You can now stop by the red town barn near the library during Farmers' Market hours to drop off your trash for $3 per bag and your recycling for $1 per box. We're excited to partner with Hartland's own Bugbee's Rubbish Removal to offer this service. We're very excited to welcome new vendors to the first market. More vendors to come! It's going to be a great summer. See you at the market!